She just wanted to save her brother, who was dying in her arms. 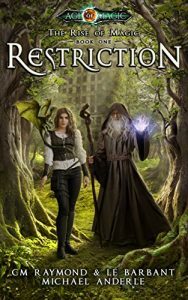 Accused of using illegal magic, and sentenced to a cruel death at the hands of the city’s guards, Hannah has no choice but to trust in the aid of a strange old man who wields unimaginable power. The Founder has returned to correct the wrongs of unjust. But to do that, he needs Hannah, a young woman from the city slums. She has a key to unlocking a power even greater than his own–if she can only learn to trust herself and the magic flowing within her blood. Get This Fantasy Book From Amazon. C.M. Raymond holds a PhD in philosophy, which qualifies him to write pop fiction but not much else. His home is in a river valley of Western Pennsylvania. Outside of reading and writing, he loves to spend time with his family in the woods and wilds or the city streets. You can also check out his Steel City Heroes saga and fast-paced thrillers, The Jack Carson Stories (beginning with The Devil’s Due). L. E. Barbant is a sometimes Professor trying to cut it as a science fiction and fantasy author. A fan of classics–new and old–Lee tries to write books that take an honest look at the world and then say screw it, let’s find a better one. Because who wouldn’t want to live in a world where superheroes were real? When he’s not reading, writing, or binge-watching 90s era cartoons, he debates grammar rules with his wife (he mostly loses those fights), plays board games with his friends (he often wins those fights), and contemplates the meaning of life with his cat named Cat (which is never a fight at all since Cat is a pacifist). Lee also co-hosts the Part-Time Writers Podcast with his friend and writing partner C.M. Raymond. He currently resides outside of Pittsburgh, PA and plans to stay there as long as the great city will put up with him.